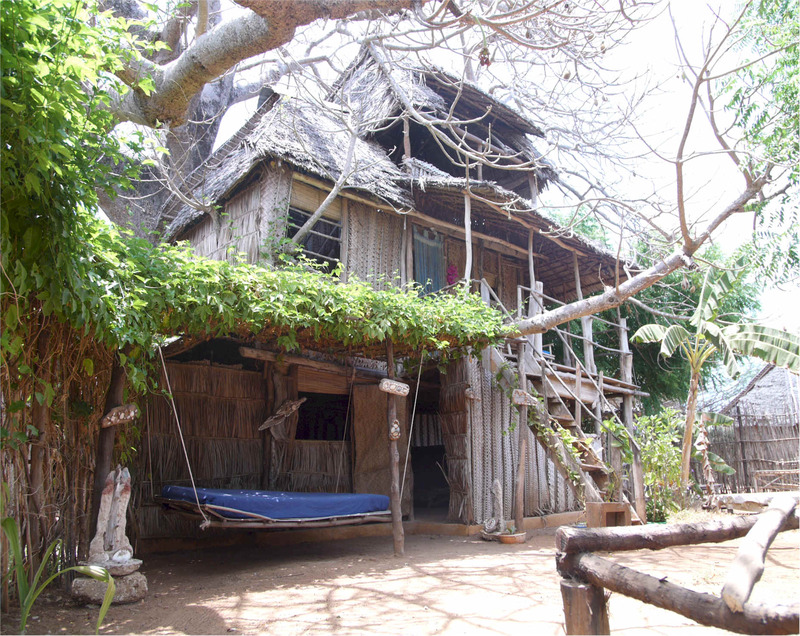 property description: The Village is situated on the island of Manda, which is the sister island to Lamu. The lodge is located on the beach front with amazing views of the open ocean, Lamu island, Shela village and dhows sailing past. It is the perfect place to come and relax for days or weeks, away from the stresses and strains of everyday life. There are no cars on Lamu or Manda, the only form of transport is donkey or boat, both of which are an experience in themselves. The pace of life is inevitably slow and relaxed. The island is located roughly three degrees south of the equator therefore you can guarantee that perfect island getaway, whether it is lazing in your airy banda, on the beach or exploring the surroundings. Diamond Beach Village provides a wonderful base from which to explore the local scenery and also take in the colourful Lamu culture and people. Or if you'd prefer, simply sit back, relax and luxuriate for days on end and let our friendly staff look after your every need, whether its breakfast in bed or drinks on the swing bed. They are happy to make your stay as peaceful and special as possible to ensure you get into the island pace of life. At Diamond Beach Village we have six beach huts called bandas, traditionally designed with high windows, the sea breeze flows through making them the ideal retreat from the African sunshine. The five double bandas have a double bed downstairs and a single bed mounted in the roof, each has a front porch, en suite shower, sink and flush toilet. All bandas are provided with sheets, mosquito nets and towels. Each has a mains plug with a British socket and all have electric lighting in the evening. Our very friendly room boy, Kombo, cleans daily and we offer a laundry service. 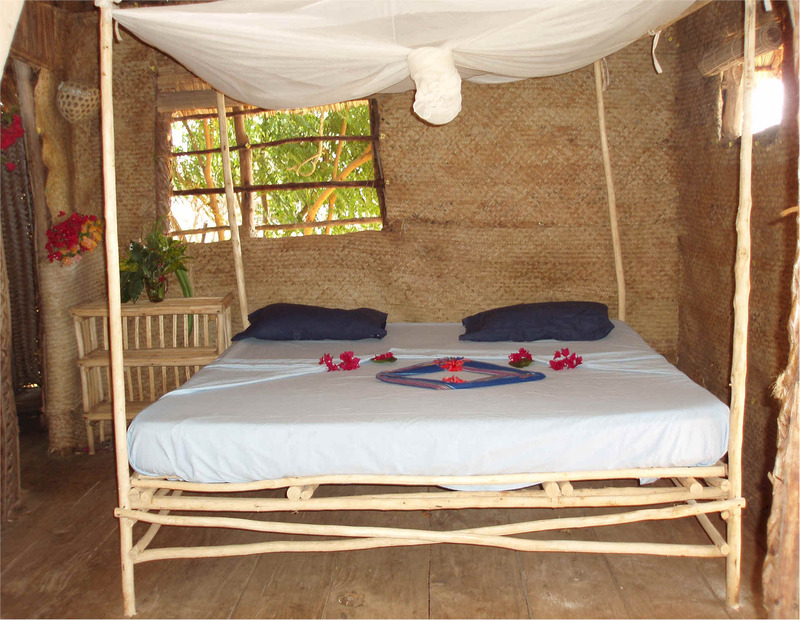 The floors and walls are made out of star palm which is woven locally, the roofs are a thatch of coconut palm. There is no fresh water on Manda Island so we re-use the water from the sinks and showers to water the garden. The sixth ‘family’ banda is larger and divided into two, it sleeps between 3-6. We also have a treehouse to rent. It sleeps between two and six people, with wooden floors, branches coming through the walls and a large veranda on the first floor stretching right around the tree, where there is an open air bathroom with sink, shower and flush toilet. There is another bathroom on the ground floor. It is an amazing experience to be lying in bed in a baobab tree watching the birds fly by with a view across the village over to the sand dunes of Lamu Island. It really is a honeymooners' paradise. beautiful white sand beach" Telegraph travel. The restaurant seating area is shaded from the sun with large palm thatched umbrellas, conveniently situated with a fantastic view of the Indian Ocean. Our experienced chef, Danson, prepares a variety of dishes from traditional Swahili cuisine to more conventional western and vegetarian foods. A must for breakfast is banana pancakes and fruit salad with fresh kenyan coffee or chai tea made from local spices. Lamu's best kept secret is its freshly caught sea food... Lobster, king prawns, crab, red snapper, tuna, squid, and much more are on the menu each day. Or perhaps try the traditional African barbecued goat or chicken. Our giant clam shells in the garden under the acacia trees act as bird baths and attract a colourful array of beautiful birds at both dawn and dusk. Sit and watch them play as you relax and enjoy your drinks. Or lie under the shade of the acacia trees on the swing beds and hammocks while listening to the lap of the Indian Ocean which is just a ten second walk away. At dusk, Diamond Beach enjoys the full view of some of the most breathtaking African sunsets. When night falls you can find your way back to your banda, lit by the shimmering light of a billion stars, over 180 degrees of perfectly clear sky. Or perhaps enjoy a moonlight swim where the shimmer of the phosphorescence is truly spectacular. You are provided with paraffin lamps for the late evening, the well muffled generator gets switched off around 10pm. “The most unspoilt place we have ever been to. A perfect place to chill out, be happy and just be. Thanks for making our yoga retreat so special. activities: If eating, drinking, swimming, reading and sleeping are not enough to satisfy the soul then there is plenty more to do. Shela village is only a 5 minute boat ride away, there are a few restaurants here and the famous Peponi Hotel where you can go for drinks and food. There are also 3 good shops selling local gifts. Lamu is more of a working town, you can visit the market and wander around the streets, there is also a good museum and nice restaurants and café’s. It takes 30 minutes to get to Lamu town. Diamond Beach Village has a small coral reef conveniently situated a stones throw from the beach. It is a safe and easy way for kids of all ages to view the underwater world. There is a vast array of colourful fish that inhabit this reef and everyday there is something new to see. Snorkelling trips can also be arranged to a larger reef which is an hour and a half boat ride away. If you are lucky you will see schools of dolphins playing around the boat. Snorkelling is tide dependant. A 10 minute walk along the shore line leads you to the point of Manda where the open sea meets the island. Along the way it is possible to see the colonial history of Lamu district evident in the ruins with rusty cannons inside. Dhows sail past but it is unlikely you will meet another person on this rugged stretch of coast. Our resident dog, Mambo, will keep you company and amused as she chases crabs along the way. You can also take a guided walk to the ruins of an old Swahili settlement, Takwa, which was built in the 16th century. This walk takes you through the heart of the island where dig dig (small deer) roam. You also pass the quarry where locals cut out the coral by hand for their traditional building blocks. The channel that divides Lamu from Manda provides the ideal opportunity for windsurfing. You can guarantee the wind will pick up at midday making perfect conditions for windsurfing. Lessons and equipment are available from Shela. Another sport that is becoming popular is kite surfing; the conditions are ideal so bring your equipment as there is none to hire. Sailing is the traditional mode of transport along the east African coast. The beautifully crafted dhows with their huge sails are a great way to get around. Sailing through the channel is a wonderful way to view the African sunset. For those who like to pass the days fishing then this is the place to hand line off the beach or from the back of the boat on the way to Lamu or Shela. For the more enthusiastic, trips can be arranged to the open ocean either on a dhow or on a modern speed boat with all the top of the range equipment. Anything caught can be cooked just the way you like it by our chefs. “To all the team at Diamond Beach. Thank you so much for making us feel so at home. This is a beautiful place. I will miss my early morning swims (with Mambo keeping me company). Getting to Diamond Beach Village is easy; fly to Nairobi or Mombasa and then transfer onto a smaller plane straight to Manda Island, Lamu. From Nairobi it takes 1 hour to reach us. From Mombasa it takes’s 40 minutes. There are 3 daily flights to and from the Island. We will pick you up from Manda airport and take you to Diamond Beach in our boat: this takes 30 minutes. Diamond Beach is open from the 1st of August until March 31st. “Well what can I say? Is this the best beach in the world? Certainly the best hosts! Wishing you all the best for the future, and if we save some more pennies we’ll be back for ours”.